Microsoft Excel 2010 Programming by Example with VBA, XML and ASP is a practical how-to book on Excel programming, suitable for readers already familiar with the Excel user interface. The book introduces programming concepts via numerous multi-step, illustrated, hands-on exercises. More advanced topics are introduced via custom projects. 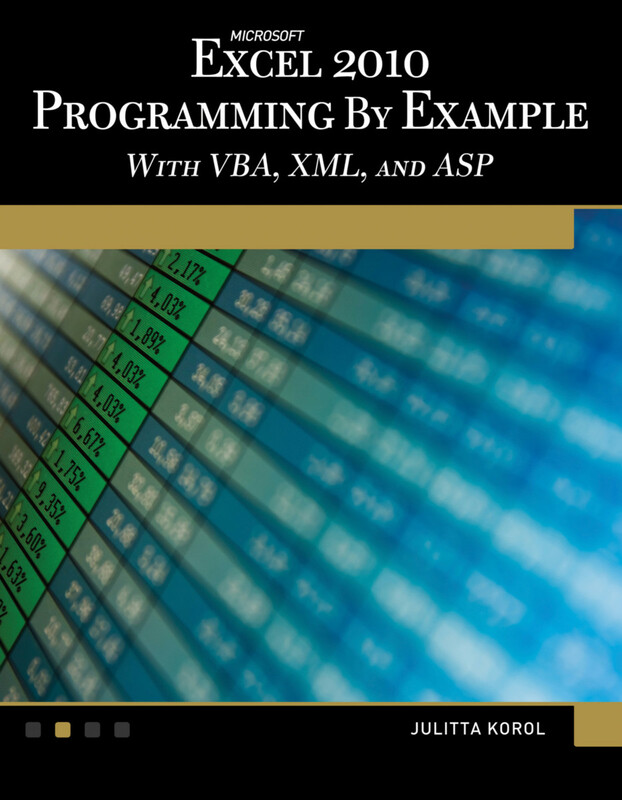 From recording and editing a macro and writing VBA code to working with XML documents and using classic ASP to access and display data on the Web, this book takes you on a programming journey that will change the way you work with Excel. Completely updated for Excel 2010, this book provides information on performing automatic operations on files, folders, and other Microsoft Office applications. It also covers proper use of event procedures, testing and debugging, and programming advanced Excel features such as PivotTables, PivotCharts, and SmartTags. Thirty chapters loaded with illustrated hands-on projects and exercises that tell you exactly where to enter code, how to debug it, and then run it. Each exercise/project step is clearly explained as it is performed. Julitta Korol is a software consultant who delivers custom-tailored, hands-on training and develops advanced database and spreadsheet applications. She has written over 20 computer books including Microsoft Access 2016 Programming with VBA, XML and ASP. She lives on Long Island, New York.